We were told of a stray kitten in Mortehoe which had been around for about a month. The lovely gent who reported the kitten said she was very skinny so he had started to feed her with bit of fish and chicken. The kitten then slowly started to come into the house and cuddle up on a chair. As we are only able to take a cat in when we have a space, the man continued to feed her until one of our fosterers was able to collect her and look for an owner. When we collected the kitten we called into Market Vets in Barnstaple who checked for – and found – a microchip! 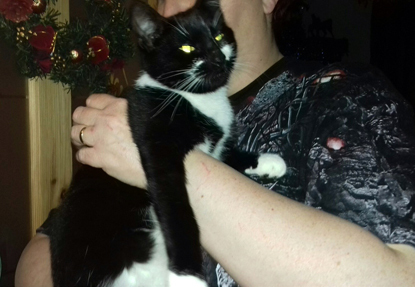 They discovered that the kitten, called Freya, was only six months old and had gone missing in October from nearby Ilfracombe. Freya’s owners don't drive so we agreed to take her round to them to be reunited. The couple were so over the moon to get her back after so long, they said it was the best ever Christmas present. They thought they would never see her again. It just goes to show that microchips do work!